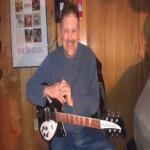 Sign up for Broadjam today to follow Frank Radice, and be notified when they upload new stuff or update their news! A Jazz instrumental with some Latin styled guitar. A Jazz or Latin Jazz instrumental that I did in 2014 and recently remastered. Reached number 1 on Broadjam Earth in 2015. Results: Viewing items 1-5 of 38. Thanks for supporting Frank Radice! Would you like to help Frank Radice get heard by industry pros by buying them a song submission credit to Broadjam Music Licensing Opportunities?